Despite the lack of a progression post last week, we did make progress, in the form of our first kill of Foreman Crusher. 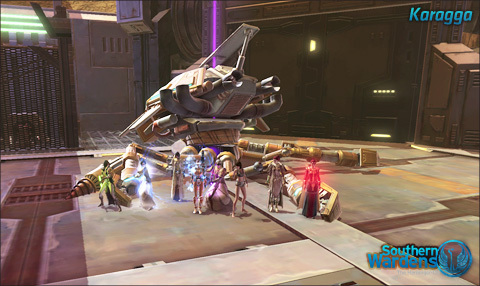 We consolidated that this week with a smooth and super-fast Eternity Vault clear on Wednesday – all bosses down in about 90 minutes, which was gratifying – and took some new people in to experience the fun of Karagga’s Palace. We cleared up to and including Foreman Crusher on Sunday night, leaving Monday night as our nominated Heavy Fabricator Clobbering Time. He spent a fair bit of it clobbering us, but eventually he got with the program and obligingly died at our feet. Emboldened by our success, we promptly wiped on trash, true to the Southern Wardens spirit as always. Undaunted, we rallied and went on to see Karagga himself, he of the funny hat and WTF GIANT ROBOT CHAIR. Hutts have all the coolest toys. We spent a couple of attempts trying out different strategies – this ‘coming to new bosses blind’ thing is timeconsuming, but very satisfying – before eventually killing Karagga on the last attempt of the night. Congrats to everybody who’s worked hard over the last few weeks; a few more kills and we’ll have normal mode of all current content comfortably on farm. Up next: hard modes! Edit: And now, with picture!